As always, Week 17 presents some interesting matchups in the NFL, particularly when it comes to coaches going up against each other. Each week, Head Coach Ranking presents its exclusive Head 2 Head numbers – comparing the rankings of the coaches that are facing off. 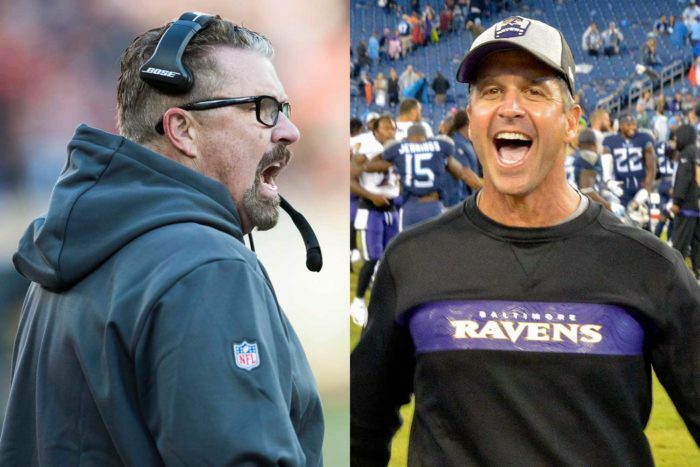 • There is only one game this week between two coaches in Head Coach Ranking’s current top 10: Cleveland at Baltimore. Browns interim head coach Gregg Williams ranks seventh overall with an HCR grade of 7.5. The Ravens’ John Harbaugh is tied for third with a grade of 7.8. • Why is Week 17 different from all other weeks in the NFL regular season? Here’s why: There are typically never more than seven or eight division matchups in any given week. In Week 17, however, all 16 games are division battles. If familiarity really does breed contempt, then Sunday’s action should be intense. • Of course, the schedule-makers plan it this way in the hopes of having as many games as possible with playoffs on the line. And there are 11 such games here – although only two games have playoff implications for both teams involved: Sunday night’s Colts-Titans game is a playoff game unto itself, with the winner in and the loser out. In Bears-Vikings, Minnesota clinches a wild-card berth with a win while Chicago, already the NFC North champ, needs a win and a Rams loss to earn a first-round bye. • Two teams that are in the playoffs have nothing to play for this week: The Dallas Cowboys are locked into the NFL’s fourth seed and the New Orleans Saints are the NFL’s No. 1 seed. Will the head coaches rest most of their starters? It’s always interesting to see how coaches handle this situation.